Oriental leaves offer a fascinating range of leaf shapes, textures and flavours. Enjoy smooth and creamy leaves from rosette-forming tatsoi or bok choy (also known as pak choi); the crunch of Chinese cabbage; or the narrow or deeply serrated leaves of mibuna and mizuna. And then there’s the intriguing range of spicy mustards: frilly, spoon-shaped, red-veined, red-leaved – even golden! Sow direct into prepared ground, or start them off in module trays to plant out a few weeks later. Most are pretty hardy and will continue to give some leaves for cutting throughout winter, especially if provided some protection in the form of a greenhouse or polytunnel. 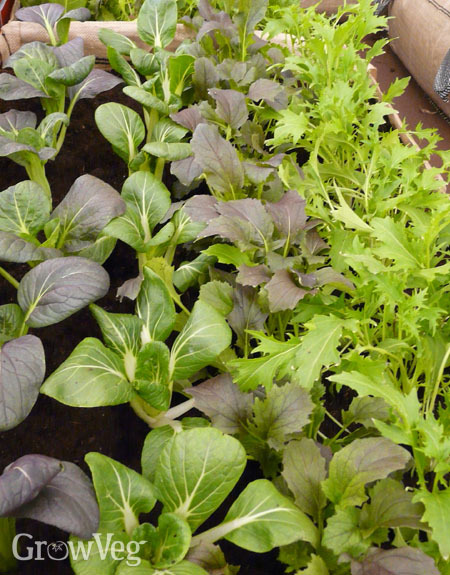 Oriental leaves grow well in pots, troughs and trays too, either as individual plants or sown as a mixture of different species and/or varieties to give a tasty explosion of flavours in one handy container. Most Oriental leaves are brassicas that often bolt, or flower, as days lengthen earlier on in the season. Sowing them from the second half of summer avoids this problem, and there are fewer pests such as flea beetle about too. Prepare soil for sowing or planting by sprinkling over a general-purpose organic fertiliser then raking it in to leave a fine, crumbly surface. Sowing into plug trays before planting out has some advantages. You can start plants off while the final growing area is still occupied by another crop, and tender seedlings are at less risk of slug damage. Fill trays with multi-purpose compost, firm it down with your fingertips then sow one or two seeds into each cell. Cover with more compost, water and place the tray somewhere bright to germinate. The seedlings are ready to plant out about a month later. Plant module-raised seedlings at their final spacings. Carefully remove plants from their cells then lay them onto prepared ground. Use a dibber or similar to make the holes, then position and firm the plants into place. If it’s dry, be sure to thoroughly water after planting. Sow direct into prepared ground, or start them off in plug trays to plant out a few weeks later. Most are pretty hardy and will continue to give some leaves for cutting throughout winter, especially if provided some protection in the form of a greenhouse or polytunnel. In cooler regions, setting up a polythene tunnel or cloche will improve growth rates as winter approaches, while a greenhouse almost guarantees harvests in all but the very coldest weeks of winter. When most plants are throwing in the towel for the season, you can always rely on the Oriental leaves for a final flourish. If you have experience of growing these loveable leaves, then please share your tips for success in the comments section below.